Tropical Winds - Located approx. 1.4 miles west of Hwy. 59 in Gulf Shores. The following information is provided by Steve Warren, RE/MAX of Gulf Shores and Orange Beach, 1 800 686-4005. 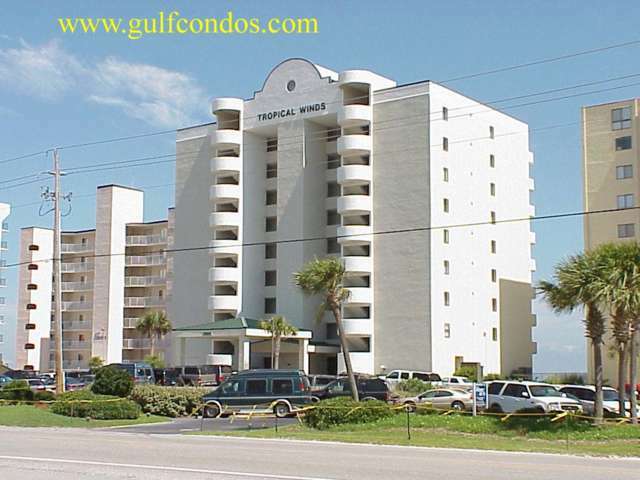 All the units in this complex offer a nice view of the Gulf of Mexico from the private balcony. There is a pool on the beachside, exercise room, and an elevator is available. It is close to shopping and restaurants. All information deemed accurate but not guaranteed. Click on the BACK arrow to return to the master list. All information on this website is deemed accurate but is not guaranteed.